Dean of the College of Education Allyson Watson at the St. Petersburg Science Festival. (July 17, 2018) – Allyson L. Watson, Dean for the College of Education at USF St. Petersburg, has been named the 2018 Girls Inc. of Pinellas STEM Woman of the Year. She will be honored at a celebration luncheon on September 14, 2018 at The Club at Treasure Island. 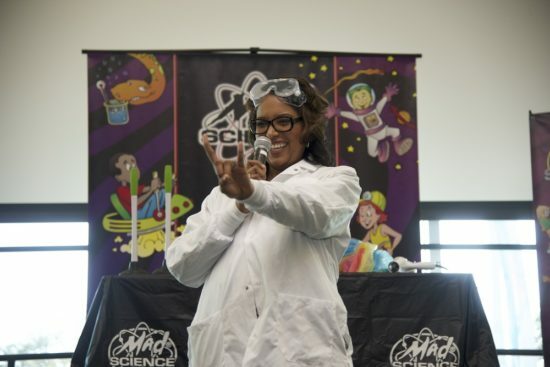 Watson was recognized for her many contributions to educating children in the fields of science, technology, education and math (STEM) locally. Recently, she helped launch USF St. Petersburg’s inaugural STEM robotics summer camp for 5th through 8th grade students. The camp is designed to inspire young students while promoting critical thinking and problem-solving skills through diverse activities in computer science, engineering, robotics and applied math—as well as a bit of marine science. This upcoming fall, the College of Education will celebrate the grand opening of a state-of-the-art innovative STEM lab. The lab will be geared towards educators, educational leaders and organizational partners to engage and experience creative ways to teach STEM fields firsthand. “Pinellas County is important to me and I am personally committed to creating the best pathways for this community to forge into education on the campus of USF St. Petersburg, across the state and in the nation,” said Watson. In 2015, Dr. Watson coordinated a team of educators from across the US to help establish the first-ever robotics lab for girls in north Haiti. The sustainable work has empowered girls and women in STEM. Through this innovative initiative, Haiti sent the first competitive girls team in the history of the nation to compete in the VEX World Championship Robotics Competition. Prior to that, Watson served as assistant dean and Northeastern State University’s first named endowed chair. She earned a master’s (M.Ed.) and doctoral (PhD) degree in educational administration, curriculum and supervision from the University of Oklahoma. Her baccalaureate degree is from Bethune-Cookman University in Elementary Education. Watson is committed to her community and impact through service, and serves as a member of the Alpha Epsilon Omega Chapter of Alpha Kappa Alpha Sorority, Inc. She believes that her job as an educator is to empower others to believe in themselves and their capacity to reach their true potential.